THE new Petaling Jaya mayor’s top priority is to ensure every part of the city is clean, including housing and commercial centres. 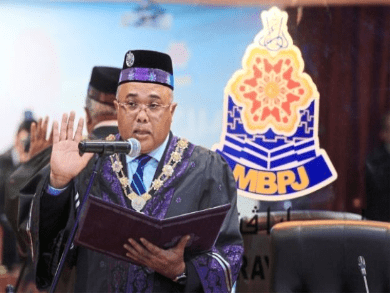 Datuk Mohd Sayuthi Bakar, 50, who was sworn in yesterday at Petaling Jaya City Council (MBPJ), said his other important duties included addressing public complaints and providing good service to the people. “We must take the public complaints seriously as we are here to provide service,” he said. As someone who has served four councils in the past eight years, he said he was seasoned in dealing with local council issues. “I hope to put my best foot forward,” he added. He thanked the Federal Government for giving him the honour to serve his mayoral duties, which he hopes to use to boost the Smart City plan for Petaling Jaya. He said he looked forward to working with MBPJ’s experienced councillors and council officers. Mohd Sayuthi, who was born in Kedah, holds a Bachelor of Arts (Hons) in South-East Asian Studies from Universiti Malaya and Masters in Information Technology from Universiti Kebangsaan Malaysia. Among his career highlights was serving as deputy director of the Immigration Department’s enforcement division in 1995. He also served in the Home Affairs Ministry and was Selangor internal audit chief. Mohd Sayuthi also served as president for both Sepang and Kajang municipal councils. He also received the Excellent Service Award better known as the Anugerah Perkhidmatan Cemerlang (APC) five times throughout his career.